Tacony Creek Park Keepers – Visit the park and get involved today! Welcome to Tacony Creek Park! Tacony Creek Park (TCP) is a Philadelphia watershed park along the Tacony Creek featuring 300 acres of streamside and woodland park habitat in the urban landscape of lower Northeast Philadelphia. Care about Tacony Creek Park? 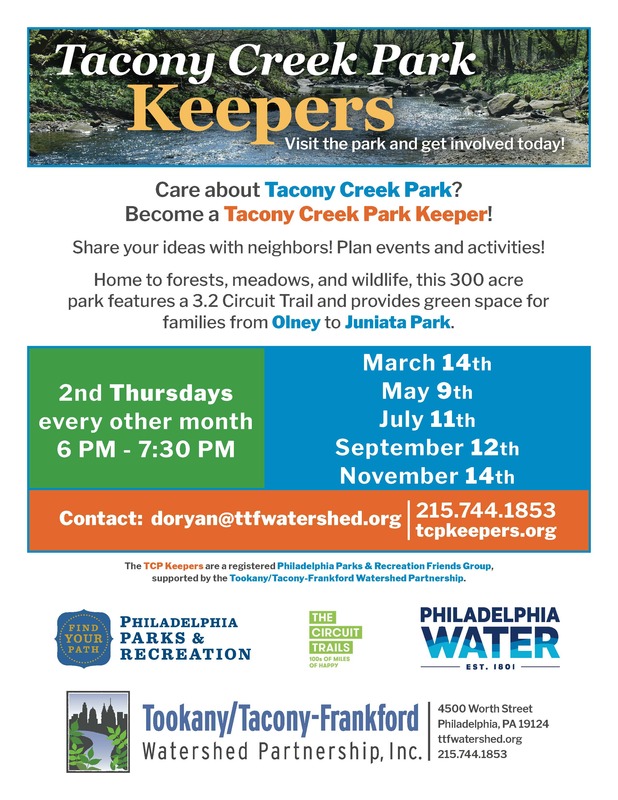 Become a Tacony Creek Park Keeper! We are a group of committed neighbors, and our mission is to provide opportunities for the community to connect with Tacony Creek Park to improve our health, lifestyle and well-being through nature, and to encourage the preservation of the 300 acre park for both the environment and the neighborhood. TCP Keepers is a registered Philadelphia Parks and Recreation Friends Group, supported by the Tookany/Tacony-Frankford Watershed Partnership. We invite you to join us in the ongoing restoration of this historic park and creek. Our next meeting will be on Thursday, May 9, 2019 from 6-7:30pm. Join us to meet your neighbors, learn about upcoming events, and share ideas for new park programs. Contact us for location.